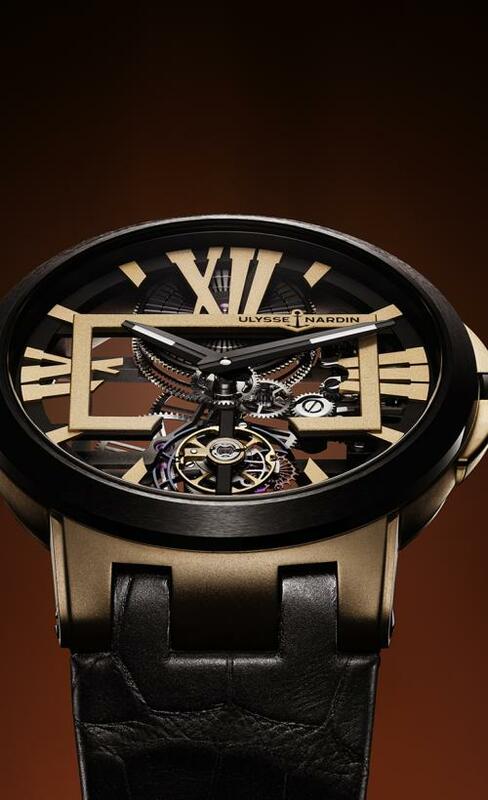 Drawing loose design inspiration (so they say) from Han Solo and the Millenium Falcon, Ulysse Nardin offers up a unique customizable variation of their sleek skeletonized tourbillon. Before we get to the supposed Star Wars tie-in to this latest launch of Ulysse Nardin, I have to force myself to take a step back and focus on the product at hand. Custom has been the new name of the game in watchmaking these last couple of years, though few of the big-box brands have taken it as far as we’re seeing now with the Ulysse Nardin Executive Skeleton Tourbillon Hyperspace. Cased in DLC-treated titanium and fitted with a ceramic bezel, these new variations of the tourbillon model are offered with beautifully hand-painted details on the rectangle and outer track that make up its dial, as well as a color-matched web-patterned detail that resides over its mainspring barrel. What makes this offering unique is that customers have carte-blanche to choose the color palette to be applied to these components, so whether the goal is to match the color of the favorite car in your garage, or any other beloved color combination, the Ulysse Nardin team will happily oblige. The cost of this customization is a fair one in the grand scheme of things. The Executive Skeleton Tourbillon Hyperspace has been priced at $46,000, which is $7,000 more than a comparable model without any customization. While that may sound steep to some, a closer look at the hand-painting process reveals that there’s no shortage of painstaking labor that goes into the equation. If you look closely at the examples already produced by Ulysse Nardin, these aren’t simply just brushed over and fired. Numerous colors are applied by hand using a brush as wide as an eyelash, creating a very interesting aesthetic that can further appreciated under a loupe or magnifying glass. When you add to the fact that each model created will be a unique piece, $7k isn’t a half bad premium, especially considering the levels of high-spec horology in the caliber itself. First launched in 2016, the manual-winding caliber UN-171 is a real showpiece of Ulysse Nardin’s watchmaking prowess. Its flying tourbillon uses a Silicium (UN speak for silicon) escapement and balance spring, and through some very thoughtful bridge and mainplate design, the vast majority of its geartrain is clearly exposed for its wearers’ admiration. Where the piece really shines is in its hefty 7-day power reserve from a single mainspring barrel. All told, it’s this kind of thing that makes the sticker price of any of these high-level Ulysse Nardin creations fairly easy to justify. OK, now onto this whole Han Solo Hyperspace song and dance. Now, we get that brands want to take any opportunity possible to partner up with major film and TV launches whenever the opportunity presents itself, and sometimes it works—case and point, the Jaeger-LeCoultre placement in the new Netflix movie Anon, where Clive Owen’s character peeks into the window at a JLC boutique. That said, other than the linear pattern of the painting on the new Executive Skeleton Tourbillon bearing a vague resemblance to the blurred stars seen when the Millenium Falcon goes into hyperspace, there is zero connection—visual or otherwise—between the watch and the beloved film franchise. At a personal level, I still like the watch as it stands on its own, but had they skipped this marketing spin entirely the piece would have just as much appeal. 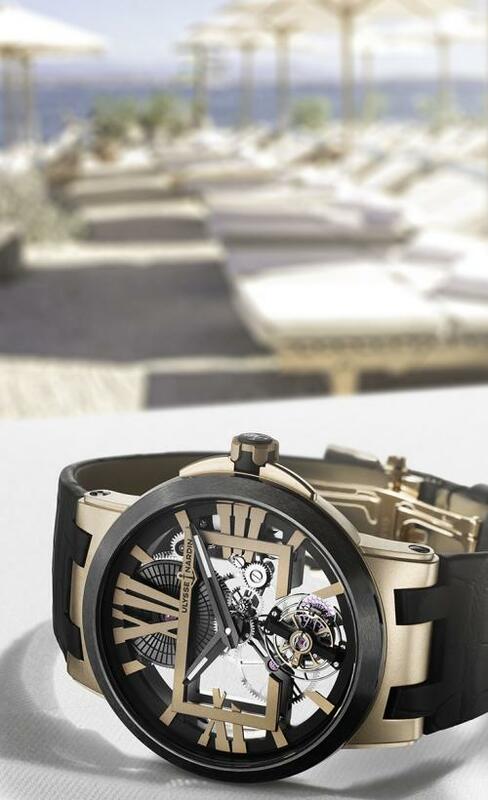 Initial deliveries of pre-designed pieces are starting now through Ulysse Nardin boutiques and retailers, and customers are able to place custom orders through their authorized retailers as of yesterday.